Imagine a world where there are no traffic jams, no auto accidents, no wrong turns or being late to an appointment. As a child who grew up in the 1980s, robots, computers that run the world and artificial intelligence (AI) were all futuristic predictions portrayed as making life, and living life, a breeze. Apparently that time is already past the corner. We now head into the world of Google’s driverless technology and the plethora of advancements that will come with it: passive technology all the way up to fully autonomous only. This advancement will mean significant transformation in our transportation infrastructure in less than a decade. There are several startups such as Getaround (car-share), Sidecar and Uber (ride-share) that offer services via mobile technology. Getaround, with a mission to reduce the number of vehicles on the road by facilitating peer to peer car (P2P) rentals through their phone app. Using your GPS location, Getaround allows for a self-service transaction as the keys are already in the car parked down the street from you. Sidecar was recently bought by General Motors who also acquired Lyft, another car/rideshare company. Uber has been valued at an astonishing high value (Forbes reports $68 billion in late 2015), likely due to the potential for market expansion through the driverless technology integration of vehicles sold in the U.S. When the car/ride share industry gained traction, Getaround, Sidecar and Uber ran into some trouble regarding the legality of the new sharing market. California state officials addressed auto insurance industry concerns over peer to peer car sharing and any effects it might have on the number of claims received as well as the taxi industry concerns. In the end, car share companies won the right to exist, however they were required to have a million-dollar umbrella insurance policy for each rental to cover inevitable events. Getaround also invested in a Bluetooth device that tracks the GPS location and provides keyless entry as you are able to unlock the car you rent with the phone app and credit card. All of these provisions helped to address consumer pain points, for both the owner and the renter, in terms of theft, security and damage concerns. The Los Angeles Times reported that “combining self-driving cars, car-sharing and various disincentives for car ownership can eliminate up to 85 percent” of traffic congestion for urban areas. According to The Wall Street Journal, studies show a 90 percent reduction in car accident rates and increased fuel efficiency. The technology could also help reduce congestion by way of improved traffic flows. Reduced traffic, reduced accidents and reduced emissions sound great. But the question is, how to get humans to let go of their control behind the wheel? How does infrastructure and regulation adapt to these rapidly evolving innovations? California just passed a law allowing driverless cars, as long as there is a human who can take over if needed. The law also makes the car owner liable for the tickets and accidents, not the computer. Studies show that 60 percent of millennials will buy a driverless car and over half of all Americans say they would consider joining the bandwagon. Further advancing the technology would be local officials raising parking fees and restricting capacity and states raising vehicle fees and instate higher sales tax. For example, Copenhagen, Denmark has a 180 percent tax rate for new vehicle purchases. Of course, all of these measures must be coordinated with infrastructure support such as significant increases in transit capacity and smarter development strategies that incorporate compact communities and convenience in getting around to do day to day errands. Another fact that supports adoption of driverless technology is a 2004 Zipcar study that shows car sharing, transit, biking and walking cost Americans an average of $150 per month while conventional car ownership was $900 per month in urban areas. Add to that an additional $9.20 per month in social costs (emissions, traffic and lost time), according to a recent study in Vancouver, and the financial incentives offered by the car share market for those seeking to reduce expenses. Thus making the car/ride-sharing market competitive with traditional car ownership, which would in turn reduce the number of cars on the road. With these factors in play, one can assume that we will soon be living in a fully autonomous transportation era, oozing of innovative possibilities and progress, both socially and environmentally. It could open the pathway to a sharing economy and a more sustainable future. The New York Times reported the unusual collaboration of Ford and Google to advocate federal policy for driverless technology and it is rumored that Uber has joined the driverless car testing market. 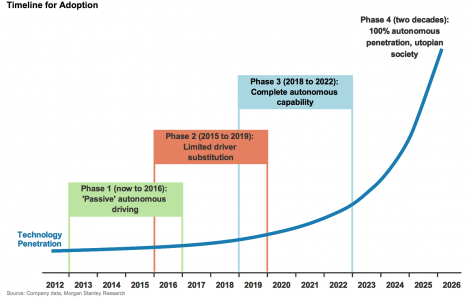 This could all signal the arrival of the self-driving car sooner than we think. Author: Andre Rivera is an MBA student at Presidio Graduate School.